Partly cloudy skies this evening will become overcast overnight. Low near 55F. Winds light and variable.. Partly cloudy skies this evening will become overcast overnight. Low near 55F. Winds light and variable. A Marion woman was arrested and charged after she was found with two handguns in her purse while trying to flee the cops in a traffic stop, authorities said Friday. 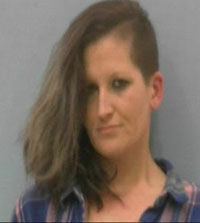 Deputy Steven McPeters of the McDowell County Sheriff’s Office charged Kasey Elaine Grindstaff, 30, address listed as Caraway Drive in Marion, with possession of a firearm by a felon, carrying a concealed weapon and resisting a public officer. Shortly after 5 p.m. on Thursday, Jan. 17, McPeters stopped a vehicle on Catawba Avenue in Old Fort because it did not have a license plate. As McPeters was talking to the driver, Grindstaff, who was the passenger, fled on foot. A short chase ensued, at which time the suspect threw down her purse and a revolver fell out. A search of the pocketbook turned up a second gun. There are no charges against the driver. Grindstaff was apprehended nearby and taken into custody. Her bond was set at $12,500.